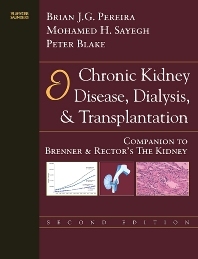 This expanded and revised companion to Brenner & Rector's The Kidney delivers a new bench to bedside review of the management of patients with end-stage renal disease. Leaders in the field present expert coverage on the physiologic principles and clinical applications of different methods of renal replacement therapy as well as the most recent guidelines from the National Kidney Foundation regarding dialysis. With 4 new section editors, new authors, 50% more content, this new edition constitutes a sweeping revision to this popular text. Presents the expertise of distinguished researchers and clinicians in the fields of hemodialysis, peritoneal dialysis, critical care nephrology, and transplantation. Provides comprehensive coverage of clinical management issues of chronic kidney disease and dialysis and transplantation. Features illustrations, including diagnostic and treatment algorithms, line drawings, and photographs. Includes a complete list of references in each chapter.